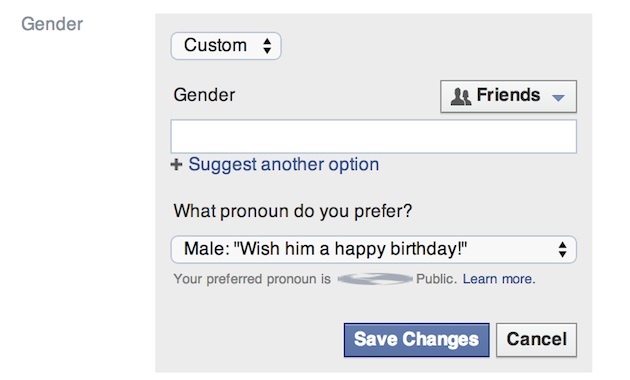 Four months after it did so in the US, Facebook is now letting UK users choose new gender options. After working with two UK organisations, Press For Change and Gendered Intelligence, the social network added over 70 new terms, allowing you to select one of the new custom genders or add your own. Users can also choose a preferred pronoun: male (he/his), female (she/her) or neutral (they/their), which is reflected in birthday notifications and suchlike. As with all profile information, Facebook lets you hide anything you're not comfortable with sharing and says it will not disclose gender selections to advertisers. To update your profile, click the 'About' tab, then hit "Edit" next to the "Gender" option in the "Contact and Basic Information" section.